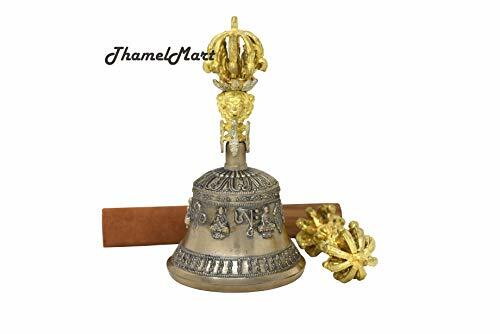 The dorje and bell are the primary ritual tools of Tibetan Buddhism. Always kept together they represent many layers of intricate symbolism and meaning and are used in almost all Tibetan ritual ceremonies, chanting and magical operations. The dorje and bell represent the masculine and feminine principles in the cosmos and in the individuals energy body. The dorje is always held in the right hand and the bell in the left as these are the sides of the right and left channels in the body. The bell is about 7 inches high. Quality Tibetan style bronze, made in Nepal. If you have any questions about this product by thamelmart, contact us by completing and submitting the form below. If you are looking for a specif part number, please include it with your message.